Richmond, as a company, has a long history in the dental market having been in continuous operation since 1895. Richmond products are recognized for high quality and are a staple in the dental practice. 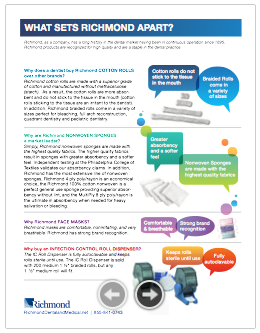 Learn why dentists prefer our braided cotton rolls, sponges and entire line of dental products by downloading the PDF below.